On its Brexit preparedness website, the European Commission has now published 60 of its "Notice to Stakeholder" series, the very latest referring to the effect of UK withdrawal on "EU rules on fisheries and aquaculture". The first notice went up on 21 November last year but, despite their importance and the informative nature of the content, they have been largely ignored by the legacy media. Thus, when the Telegraph finally notices the last one, journalist James Rothwell calls it a "letter". This "letter", Rothwell characterises as a "warning" to European fishermen that "they will have to ask Britain for permission before spreading their nets in its waters in a 'no deal' Brexit scenario". Of course, this is not what the "Notice to Stakeholders" series is about. Specifically, the Notices are a response to the European Council's request to set out "the consequences of the withdrawal of the United Kingdom from the European Union without a formal, ratified agreement between the United Kingdom and the European Union". As such, the series is as near as is possible a dispassionate, factual account, without embellishment – and noticeably without preachy "warnings". Using less than 1,300 words (shorter than this blogpost) to state the position, the Commission's notice on fisheries starts with the simple statement that, subject to any transitional arrangements, as of the date we withdraw from the EU, "the Common fisheries policy rules no longer apply to the United Kingdom". As to the consequences, these are set out in an entirely matter-of-fact tone, the first one of which on the Commission's list is that: "In accordance with international law of the sea, fishing vessels wishing to engage in fishing activities in waters under the sovereignty or jurisdiction of a third country are required to obtain a fishing authorisation from that third country". What that amounts to, as somewhat more luridly stated by Rothwell, is that boats carrying the flags of EU Member States, which were previously authorised to fish in UK waters under CFP provisions, will no longer be able operate – unless they have the specific permission of the UK government. Should they obtain that permission, the fishing vessels will be "subject to applicable laws and regulations of the concerned coastal state [i.e., the UK] and hence may undergo control and enforcement activities carried out by the authorities of the coastal state concerned". The implications of such a development are not stated in the Commission notice, but it doesn't take a great deal of imagination to work them out. Unless the UK government has been able to devise a fisheries management scheme – which it has not yet done – they can be summed up in a single word: "chaos". Fisheries management schemes are not simple, especially in the waters surrounding the UK, where the proliferation of species, the environmental pressures and the competing demands on the resource create special problems. The situation is also exacerbated by historical relations with our neighbours, international law and the residual effects of the CFP – which have not as yet been defined. Assuming a clear sheet (for the purpose of argument), even when EU-flagged boats are fishing in UK waters, the flag States are "responsible for diligently monitoring" the activities of vessels flying its flag, "to ensure that such activities do not undermine the sustainability of the stocks in the coastal state's waters and are consistent with applicable conservation rules of the coastal state". Whether we can rely on, say, the Spanish government to monitor and control the activities of its flag boats is questionable, but that's what the Commission is saying must happen. Then there is an interesting rider, dressed up in EU legalese in the Notice to Stakeholders. It sends a huge broadside across the bows of HMS UK. Essentially, in the Notice, the Commission is reminding the UK government that it has a veto on applications by operators of Member State fishing vessels to fish in third country waters. There is in fact a formal procedure, where EU Member State flagged boats must be specifically authorised by the Commission to fish in UK waters. Without that authorisation, they cannot do so, even if they get permission from the UK authorities. What this means is that, even should it have that in mind, there is no possibility of the UK doing separate deals on fishing with individual EU Member States. We must either deal with the Commission or not at all. Predictably, UK vessels which have rights in the waters of EU Member States will no longer keep those rights. The Commission Notice states that access by third country vessels to Union waters "is subject to the authorisation procedure foreseen in Title III of Regulation (EU) 2017/2403". And that requires possession of an authorisation issued by the European Commission in accordance with Articles 32 to 34 of Regulation (EU) 2017/2403" They must also comply with the other requirements in that Title, notably Article 38 of Council Regulation (EU) 2017/2403". Thus, there is no possibility either of the UK doing deals with Member States on reciprocal access. Once again, we deal with the Commission or not at all. Despite that, even at the topmost political level, this is not understood. Thus we have the Guardian report of Mrs May visiting Danish prime minister, Lars Løkke Rasmussen. The two leaders, we are told, discussed fishing rights and May promised that Denmark, whose boats regularly fish in British waters, would get "fair and reciprocal access" after Brexit. But reciprocal deals are not in the gift of any UK prime minister. The level of access by individual Member States will be decided by the Commission, as will UK access to Union waters. Even then, the bad news doesn't stop there. Much of the fish caught in UK waters has no domestic market. It is landed directly in ports in EU Member State territories. But, in the Notice to Stakeholders, the Commission reminds us that Regulation (EC) No 1005/2008 applies to UK vessels wishing to land fish in the Union. Specifically, Article 20 applies, setting out requirements which must be satisfied before fish can be landed. And these requirements cannot be met without detailed agreements between the Commission and the UK. What this amounts to is that, before we are able to sell our fish to the Continent, we will have to agree a fisheries management plan with the Commission. We will not be free agents. This Article, though, not only applies to landings but also to exports. Certification of all catches in accordance with Article 20 is required. But they not only have to be validated by the United Kingdom competent authority but they must also conform with a certification scheme which must be agreed between the Commission and the UK government. That refers back to the management plan. Putting all these provisions together, as set out in the Notice, what this all means is that, should the UK choose to go it alone, it will get its direct control over UK waters. That, after all, was the objective of Brexit. But this control will come at a price. The UK will not be able to do deals with other EU Member States, our vessels will not be able to land fish in EU Member State Ports and we will not be able to export fish to the EU. Furthermore, if we do want to sell fish to the EU, we have limited scope to develop independent fisheries management plans. Then, to add insult to injury, the Commission blandly informs us that producer organisations and inter-branch organisations recognised in the United Kingdom "will no longer be considered professional organisations under EU law". Over the weekend, Nigel Farage and others joined fishermen to make a noisy protest about the "betrayal" of the fishermen over the 21-month transition deal, which basically perpetuates the CFP for the period. 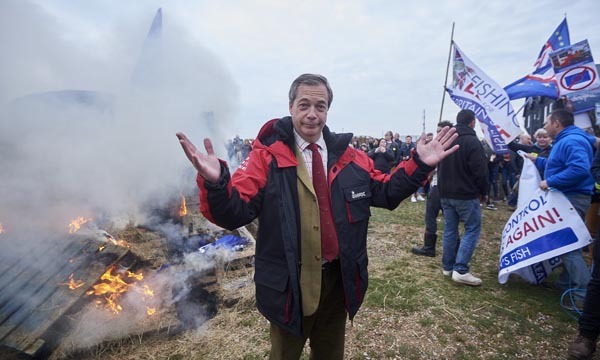 He attended the ritual burning of EU flags followed by the burning of a single, derelict wooden boat. But, as Guardian writer Fay Schopen notes, "Nigel Farage is no fisherman's friend: he's been ignoring them for years". And that is the case – in the absence of a properly crafted fisheries plan, independence will be a Pyrrhic victory for the fishermen. Planning, though, is something Farage could never be bothered to do, and without that he's leading the fishermen up the garden path. Thus, when the shouting has died down, Farage may find himself needing to burn a lot more boats. They'll not be a lot of use for fishing.